We live in a pressured, competitive world, which for many leads to an elevated anxiety stemming from over overthinking and catastrophizing which often feels impossible to counter. It was this that I spoke about on BBC Radio Nottingham, trying to address how it manifests and affects individuals and relationships, and what can be done to manage debilitating results. Such thought processes that lead someone to see only the negative; to be hyper-aroused to perceived threats; to be fearful of a growing list of things, can be caused by many factors. It may be that you grew up with anxiety within the family and modelled on this. A specific trauma may have happened and once that seed was planted, you may have continued to water it every time a place, or smell or sound etc. reminds you of what happened, and you are right back in that distressed state. Also the stresses of life are cumulative and things can gradually build up to a headspace where everything now overwhelms and creates a worry. 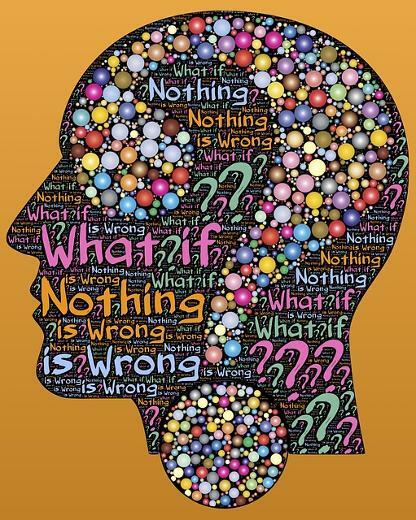 Before you know it, you are worried about being worried; about the abstract, the ‘what ifs’. Fearful at the thought of what might happen despite any evidence of threat. It’s exhausting. Your world has shrunk as you avoid places, people, and situations that may trigger panic owing to association and memory. Rituals and forms of OCD behaviours become necessary and reinforced in order to gain some control and reassurance in your frightened state. Relationships suffer. You might find yourself comparing yourself negatively to others; striving to be perfect in all you are and do. You notice physical ailments such as nausea, headaches and a weakened immune system. When we are anxious we tend to be focussing on what lies ahead, future concerns, so as much as you are able, try to stay in the present and ground emotional instability. And breathe. Seek help and accept offers of support. Chronic worrying is a mental habit that can be broken. You can train your brain to stay calm and look at life from a more positive perspective. It is treatable.